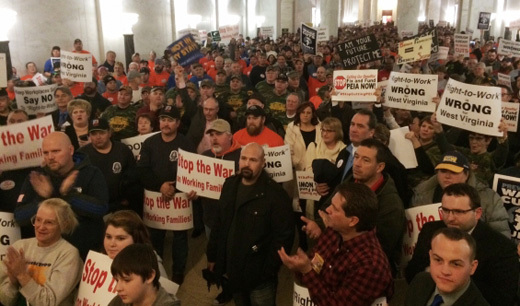 CHARLESTON, W.VA. (PAI) — Brushing aside worker protests that brought several thousand people into the streets and jammed its Capitol building, the Republican-run West Virginia Senate approved a so-called “right to work” law. The GOP-run House appeared poised to agree to it. Gov. Earl Ray Tomblin (D) vowed to veto the measure, but the GOP only needs simple majorities in each house to override him. Activists jammed the state capitol, holding signs that said “Not in my state” and “Right to work is wrong.” Speakers — including West Virginia AFL-CIO President Kenny Perdue, AFL-CIO President Richard Trumka, Mine Workers Vice President John Duffy and the presidents of both U.S. teachers’ unions — urged them on. “Right to work is “pushed by out-of-state interests that have a complete disregard for our local economy, our rights, and the health and safety of the average West Virginian,” Perdue said. 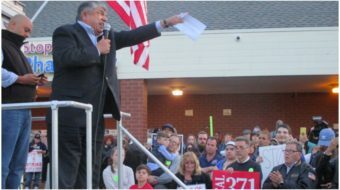 Proving his point, Americans for Prosperity, a front group of the right wing Koch brothers, led a multi-million dollar campaign for RTW, and crowed over its success. And West Virginia’s ruling Republicans made the RTW bill — which workers and their allies call “right-to-work-for-less” — the first measure introduced in the Senate in January. 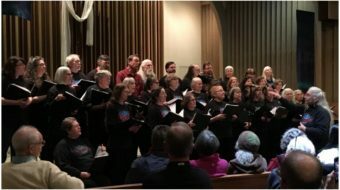 Right to work lets all workers — union and non-union — in a union-represented shop refuse to pay dues, or even lesser “agency fees” for the union’s services, the state fed said. But the union still must serve all of them, even defending non-payers against unjust bosses. “Opponents like to say that this makes states more attractive to businesses, but of the 10 states with the highest unemployment rates, seven are ‘Right to Work’ states,” the state labor federation noted. The state’s most-popular politician, U.S. Sen. Joe Manchin (D), a former governor who may seek the office again, also blasted right-to-work. “I never had a single company tell me that it would relocate to our great state if only we would pass ‘right-to-work’ legislation. Simply put, this is a partisan bill that will do nothing to create jobs in West Virginia,” he said.